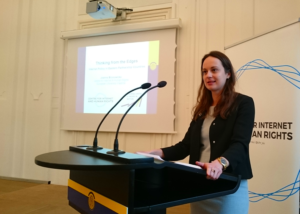 Frankfurt (Oder), January 12, 2017 – Joanna Bronowicka has been named the Director of the Centre for Internet and Human Rights at the European University Viadrina in Frankfurt (Oder). Having previously served as the Executive Director, Bronowicka will lead an international team of researchers and fellows who study the impacts of digitisation on society and human rights. “We have worked closely together for years and I cannot imagine anyone better to develop the CIHR at Viadrina” – says Ben Wagner about the new CIHR director. Wagner, who founded the centre in 2014, will contribute to the CIHR as a Senior Researcher. He will continue his research on technology in international relations at Stiftung Wissenschaft und Politik (SWP), a leading German think tank for international and security affairs. “We will continue to produce research which can inform public and academic debates.” – says Joanna Bronowicka. “It is evident that digitisation has changed many aspects of our everyday life – how we work, move from one country to another or get news during elections. The Internet also brings about new challenges to our rights and freedoms. We need high-quality research to respond to these challenges” – she adds. In 2017 the CIHR will develop interdisciplinary projects focusing on three groups particularly affected by digitisation: workers, migrants and voters. The Centre will develop research on the impacts of digitisation on workers and their rights with a particular focus on algorithmic management and workplace surveillance. The centre will also participate in research projects on the use of digital tools by and for migrants in cooperation with Berlin-based organisations working on migrant integration. Finally, the centre will continue its work on how big data and algorithms can affect election results and contribute to the public debate in Germany and beyond. The incoming director, Joanna Bronowicka is an experienced researcher, project coordinator and organisational builder. Bronowicka studied at Harvard College in the US,as well as Sciences Po and Sorbonne in Paris, France. She has participated in research projects on human rights, digitisation, migration, social movements and political participation. As the Executive Director at the CIHR, she was responsible for coordinating research projects, fundraising and staff development. Bronowicka has also considerable digital policy and communications experience. Before joining the CIHR, she worked for the Ministry of Administration and Digitisation in Poland, where she contributed to the development of Polish digital strategies and policies. She had also previously worked as a journalist at Thomson Reuters in Warsaw and as a diplomat at the Ministry of Foreign Affairs of Poland. In Germany, she has conducted courses on digital diplomacy for Institut für Auslandsbeziehungen-Akademie and the Heinrich Böll Foundation. The CIHR is a vibrant hub for academic research on technology and society at European University Viadrina in Frankfurt (Oder). It provides a platform for individuals who share a common goal of promoting high quality research on internet and human rights. The core academic team is comprised of scholars and PhD candidates from international relations, political science, sociology and law. The international fellowship program brings together practitioners, researchers, activists, philosophers, diplomats, computer scientists, who help translate academic results into real-life impact. Previous Post: Workplace Surveillance: is our privacy protected at work?